The radio regulator is currently advertising the local DAB digital radio multiplex licence for Mid Wales and West Wales. Following a licence award, radio services are likely to be on air at the end of 2009 or in early 2010. Channel 10C is available for the northeastern part of the licence area, whilst channel 12D will cover the southwestern transmission area. This means between sixteen and twenty stations could launch on DAB across the regions. The licence is offered for radio stations covering the counties of Pembrokeshire/Sir Benfro, Carmarthenshire/Sir Gaerfyrddin, Ceredigion and Powys, subject to frequency availablilty and transmitter locations. It is likely Town and Country Broadcasting, owners of Radio Pembrokeshire and Radio Carmarthenshire, Radio Maldwyn's owner Murfin Music International and Radio Ceredigion from Tindle Radio may form a consortium with DAB multiplex operator MuxCo, who are planning to make an application for the multiplex. The Mid and West Wales advertisement is part of the updated timetable for 2007/2008 for DAB multiplex licences. Radio UK Holdings Limited, owned by Macquarie Bank Limited of Australia, has handed back the licence it won in March 2006 for Plymouth's new FM radio station. Diamond FM was to have launched within two years of the licence award, but Radio UK Holdings failure to win any other local or regional FM licences has meant a review of its plans. The licence is being advertised once again by Ofcom, the media regulator. TEAC's Reference 300 DR-H300 DAB receiver with DVD player offers a one-unit solution for a variety of functions. The new RD21 plays for up to 150 hours on one set of batteries. Somerset and parts of North Wales are added to the proposed list for local DAB. Core, Life, Virgin Radio, Classic FM and talkSPORT can now be received on a DAB digital radio in Chesterfield, Derbyshire and Workington in Cumbria. Details of all services can be viewed on our radio directory pages. A shower of local DAB services is promised for Gloucester to launch by the end of 2008. October 2008 sees the launch of Fox, Jack FM and BBC Radio Oxford on local digital radio. The new modern rock radio station for South Wales, Xfm, is busy testing on 107.3FM in and around Swansea and on 106.8FM in Cardiff in time for its launch at the midday towards end of the month. Pure's latest DAB clock alarm radio offers 4 alarms and an automatically dimming display. Intempo's inexpensive DAB radio features FM RDS and runs on AA batteries. This natty mp3 and video player sports a DAB radio, tilting screen for function selection and joins the Cowon iAudio D2 player in a new range of smart DAB radios. Pure's new DAB portable radio is a familiar take, with some new themes. Core, Life, Virgin Radio, Classic FM and talkSPORT can now be received on a DAB digital radio in parts of the Scottish Borders. Details of all services can be viewed on our radio directory pages. Gold, Northants 96 and BBC Radio Northampton will launch on DAB in September 2008. 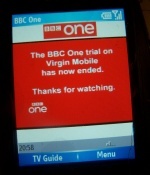 The trial broadcast of BBC One on the Virgin Lobster DAB mobile has ended, following the news in summer that the provider of the mobile TV service, BT Movio, is to close. The contract between Digital One, which operates the multiplex that carries the mobile TV service, and BT Movio is set to expire in 2008. All mobile TV streams carried on the Digital One multiplex will then be stopped. Happily, the DAB digital radio services are all unaffected and can still be received on the Lobster DAB mobile. 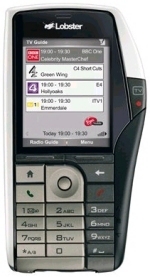 The end of carriage of the TV services follows poor sales of the Lobster DAB 'phone, which was the first commercially available mobile that can receive DAB broadcasts. The 'phone was heavily discounted earlier this year from its original price of GBP199. BBC 6 Music, Virgin Radio and Planet Rock can now be picked up in parts of Cumbria. Pure's new DAB clock alarm radio aims to be eco-friendly in more ways than one. There is just one interested party for the local DAB digital radio multiplex serving North Yorkshire. MuxCo's second win of the day ensures Northeast Wales tunes into DAB digital radio from next summer. New DAB applicant MuxCo gains its first licence award for the two counties, paving the way for services to start in September 2008. Day One Radio, which featured on local DAB digital radio multiplex serving Wolverhampton, has been taken off the area's Access Channel. It is understood many of the programmes on Day One Radio will be carried on UCB's UK and Inspirational stations, which are due to launch on the MXR-operated West Midlands multiplex on 1st October 2007 (see below). Now Digital, which owns the multiplex, failed to secure a deal with UCB to carry the Christian music and praise services on their multiplexes. The station for Panjabi language, heritage, culture, traditions, music and acts - Panjab Radio - is due to launch on the West Midlands as a replacement for the DAB output of jazz music station jazzfm.com on 1st November 2007. The station already features on the London III and Bradford/Huddersfield DAB multiplexes. Ofcom, the media regulator, has removed the requirement for local DAB multiplex operator Now Digital to provide an additional station on its Exeter & Torbay multiplex, and for a replacement adult contemporary music service on the Cardiff and Newport multiplex, following the sale of Century FM by parent company GCap Media to GMG Radio in October 2006. Following the removal of Saga Radio from the South Hants multiplex in February 2006, Ofcom has also decided that Now Digital (having taken over the operation of the multiplex after the merger of Capital Radio/GWR Group) need not provide a replacement easy listening service on the multiplex. A new celebrity gossip and top 40 hit music station heat is to launch on several local DAB digital radio multiplexes up and down the UK. The new station will be heard on the DAB digital radio multiplexes serving Ayr, Glasgow, Edinburgh, Dundee and Perth, Northern Ireland, Manchester, Liverpool, Central Lancashire, Tyne and Wear, Teesside, Humberside, Leeds, South Yorkshire, Inverness, Birmingham and on the London I multiplex. The existing station will be relaunched in the areas in which it already broadcasts. The change to the station's output represents a shift to a fresher sound and a cut in ad breaks. In Birmingham, heat replaces easy listening music service Magic on DAB, Smash Hits Radio on London I, MFR FM in Inverness and, for the first time, appears on the Manchester multiplex. All 5 local FM services - including BBC Radio Oxford - could take their place on DAB in Oxfordshire if MuxCo's licence application is successful. Edinburgh's local FM station Talk 107 has applied for carriage on the Central Scotland regional DAB digital radio multiplex and is due to begin broadcasting on the multiplex shortly. The multiplex broadcasts to a region of around 2.75 million people. Traffic and roads service Traffic Radio will launch on the Stoke DAB digital radio multplex shortly, it has been announced. The service already appears on many DAB multiplexes across England. The station will give Highways Agency road information for the Midlands and beyond. Radio Hampshire, the new name for 107.8 The Saint, under new owners Town and Country Broadcasting, is the first from the company's portfolio to be heard on DAB digital radio. 107.8 The Saint already occupies capacity on the South Hants multiplex. Radio Hampshire takes over space on the multiplex. The company runs a number of local FM stations in South Wales including Swansea Bay Radio and Bridge FM. Who will go for Gloucester? The new multiplex will carry Channel 4 Radio and bring back national talk station talkRadio. Almost a level playing field for Northants DAB radio multiplex? Two applicants offer similar services - but Now Digital has the advantage of operating 18 existing local radio multiplexes. A new traffic and roadworks information station has launched on DAB digital radio multiplexes serving in Birmingham, Manchester, Central Lancashire, Humberside, Leeds, Liverpool, South Yorkshire, Teesside, Tyne & Wear, London, Leicester, Nottingham, South Hampshire, Swindon and West Wiltshire, Bournemouth, Bristol, Cambridge, Coventry, Exeter and Torbay, Kent, Norwich, Peterborough, Plymouth and Cornwall, Reading, Southend and Chelmsford, Wolverhampton, Bradford and Huddersfield. The new station can be heard on DAB digital radio in the above areas. The launch follows a successful trial in Bristol last autumn. The station replaces Smash Hits Radio on Emap's local digital radio multiplexes and the multiplex serving Manchester. The new regional radio station for South Wales, Xfm, has launched on South Wales' regional DAB digital multiplex as Xfm UK, before its launch on FM in the region. Xfm UK will run until launch time, when the service will switch to its South Wales output. The station can already be heard on the local DAB digital radio multiplexes serving Bristol and Cardiff. The station for kids found on many regional DAB multiplexes up and down the UK, Capital Disney has ceased broadcasting. Century radio in Birmingham has been taken off the city's local DAB digital radio multiplex. Traffic Radio is its replacement. New DAB applicant MuxCo loses out to established operator Now Digital for northern home counties licence. New DAB applicant MuxCo promises local rock and news services for its Hereford and Worcester DAB application. The station for kids found on many regional DAB multiplexes up and down the UK, Capital Disney is set to close, with nonstop music replacing it until 29th June. The radio regulator is currently advertising the local DAB digital radio multiplex licence for Oxfordshire. Following a licence award, services are likely to be on air at the end of 2008. Likely applicants include Now Digital, who will want to see Fox FM take to the digital airwaves. The new regional radio station for South Wales will be new rock music station Xfm. The station will also play tracks from unsigned artists in Wales. The extremely well built Type R portable is now available. We take a look at the forthcoming SongBook 100 DAB/FM portable from Tivoli. The follow-up to the highly rated R1 features twin speakers and MP3 player input. A host of new national commercial radio DAB transmitters is in the pipeline. Now Digital is the sole operator electing to run the local DAB digital radio multiplex for Derby and Derbyshire. With only four existing stations serving the area, Northamptonshire could see a significant rise in its radio services in 2008. The new multiplex ensures BBC Radio Wales and Radio Cymru will be heard on the multiplex, but not the forthcoming BBC Radio Chester. The next UK-wide DAB multiplex will go to one of two bidders. Country music station 3C closed down today. The Emap-owned DAB digital radio station broadcast across several local DAB digital radio multiplexes in Scotland, North-West and North-East England, and on the national commercial DAB multiplex serving Northern Ireland. There is no word yet of its replacement. The radio regulator is currently advertising the local DAB digital radio multiplex licence for Herefordshire and Worcestershire. Following a licence award, services are likely to be on air at the end of 2008. The media regulator has amended the advertisement for a local DAB multiplex for Pembrokeshire and Carmarthenshire to cover Powys and Ceredigion, in order that as much of the population of Wales as possible can receive DAB digital radio broadcasts. BBC Radio Wales and BBC Radio Cymru both have capacity reserved on the multiplex. With its distinctive Rotodial, the VitaAudio R1 heads for the higher end of the market. A full report from the south-west's largest hi-fi event. The new Manchester-wide FM radio station will be RockTalk 106.1, it has been announced. RockTalk will be "a speech and rock music service for 35-64 year-olds, which contains a strong commitment to local news, current affairs and interactive debate for the Manchester area". The station beat off competition from 10 other applicants, including The Arrow, Original FM and Jack FM. Sunshine 855 owners Laser Broadcasting have won the new local FM radio licence for the counties of Herefordshire and Monmouthshire. Herefordshire and Monmouthshire Classic Hits is aimed at all age groups and will play music sourced from several decades, with speech programmes and information. The radio regulator is currently advertising the local DAB digital radio multiplex licence for Northeast Wales and West Cheshire The local radio multiplex will include capacity reserved for BBC Radio Wales and BBC Radio Cymru. The radio regulator is currently advertising the local DAB digital radio multiplex licence for Derbyshire. The multiplex is likely to launch in 2008. Virgin Mobile has sold less than 10,000 of its Lobster TV mobile 'phone, according to MediaGuardian. A high-profile ad campaign running on primetime TV has failed to convince consumers. The service, which uses DAB digital radio spectrum to broadcast TV to the 'phone, is supplied by BT Movio. The service carries only five channels (BBC1, ITV1, Channel 4 and E4 simulcasts, plus ITN News) and it is thought this, together with the fact that the Lobster 700 is the only 'phone currently equipped to receive broadcasts, has contributed to the poor uptake. The price of the Lobster 700 has been recently halved to GBP 99. Chill, the chillout music brand found on many local DAB digital radio multiplexes in England and Wales, has launched in Edinburgh and Glasgow on DAB digital radio. The station was added to the Brighton and Hove and London III multiplexes last year. The station can be heard on the local DAB digital multiplexes serving Glasgow and Edinburgh, replacing Xfm UK. Xfm Scotland can still be heard on the central Scotland regional DAB multiplex. UCB UK, the radio station of the United Christian Broadcasters, has launched in London. The station is airing on DAB digital radio, on the London II multiplex.